The day has finally arrived: Berserker has been unleashed! International heavy metal group BEAST IN BLACK have released their debut album through Nuclear Blast Records. To mark the occasion, the band with ex-BATTLE BEAST guitarist Anton Kabanen has launched another taster in the form of a brand new lyric video for "Born Again". The video also includes a studio performance by vocalist Yannis Papadopoulos and was shot and edited by Stergios Kourou. Check it out below. Helsinki-based five-piece BEAST IN BLACK was founded by Anton Kabanen soon after he had parted ways with BATTLE BEAST in 2015. By the end of 2015 the band had played their first gig, where they opened for NIGHTWISH. Berserker was produced by Anton in his Sound Quest Studio. Its cover artwork marks the return of the collaboration between Anton and Roman Ismailov who was the original illustrator and graphic artist for BATTLE BEAST. 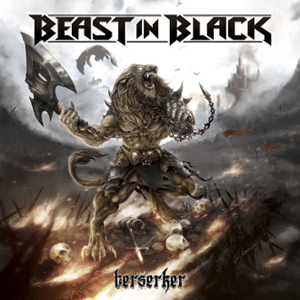 Berserker maintains the style of Anton's previously composed works, which include the first three BATTLE BEAST albums. Influenced by 80’s metal bands such as JUDAS PRIEST, MANOWAR, W.A.S.P., BLACK SABBATH and ACCEPT, the record contains all the elements of a great heavy metal album. "It's very straightforward, catchy, powerful and occasionally mixed with some symphonic influences," Anton adds. Lyrically, Kabanen also continues his previous style: "Many songs such as the title track, "Beast In Black", and "Zodd The Immortal", are strongly influenced by the Japanese manga and anime Berserk." Unfortunately, the current tour dates with W.A.S.P. have been cancelled. The band explained the reasons in a status update via their Facebook page: "We did not get the treatment that we were guaranteed, so we are really sorry but we are not able to continue the W.A.S.P. tour. We are very sorry for everyone who wanted to come and see us live..."